Do Skydivers Have a Death Wish? Woooow. No. Nopey, nopey nope. Aw, HECK naw. 1. Skydiving feels really good. In their heads, people who don’t skydive often compare making a jump to hopping on a roller-coaster. In actual fact, it’s incomparably different. Roller-coasters, first of all, don’t feel good! They’re clangy and one-size-fits-nobody, with hard, cold bits shoving at you as you try to keep your ears from crashing into the bar that keeps you on. Yeowch. 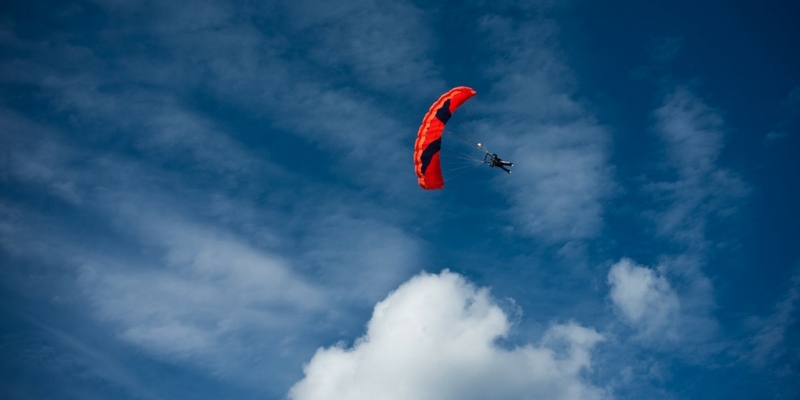 Skydiving is way more thrilling than a roller-coaster, and it’s in a totally different category of comfort. There’s no hard metal bar here–it’s a soft, strong harness that adjusts in several places to your unique body. When you leave the plane, there’s no feeling of dropping; no banging metal–you’re supported by a cushion of sky in a way that makes you feel supported and in control, not cruising-for-a-bruising. 2. You can choose your own adventure. Further along the roller-coaster-comparison lines: On a skydive, you’re not on the same track that everybody else is on. You have a say. You ask your instructor to keep the jump super-simple or, if you’re stoked for it, to choose safe ways to make the jump even more exciting. Your instructor is ready to make sure your experience fits what you want and need–not just to check that the roller-coaster bar is locked. 3. Skydiving doesn’t even feel like falling. Maybe it’s the implication of helpless falling that makes people think skydivers have a death wish. The idea of starting in a safe place and flinging yourself out into nothingness seems like a fatalistic bid. However: Since skydiving doesn’t even feel like falling, that logic doesn’t hold up to inspection. In order to feel the sensation of “falling,” a human needs to perceive that he/she is moving through something. The brain needs to calculate that by using visual depth. Since the world from freefall looks like a flat map than terrain, there’s no perception of depth, and the sensation of falling can’t quite kick in. 4. We have all kinds of safety technology keeping watch on us. With all those joys and fail-safes, does it sound like we’re a sport full of death-defying goth kids? Most certainly not. In fact, we’re some of the happiest, most fulfilled people you’ll ever meet! You’ll see it for yourself when you come out to the dropzone. And who knows; you might just get that license and join our ever-so-lively ranks.